Finding dependable “truths” from the turbulent publishing world is like trying to catch a bird from a roller coaster. By the time you reach up, publishing has flown by, in new directions. The best advice may be to climb aboard, enjoy the ride, and focus on the track ahead. 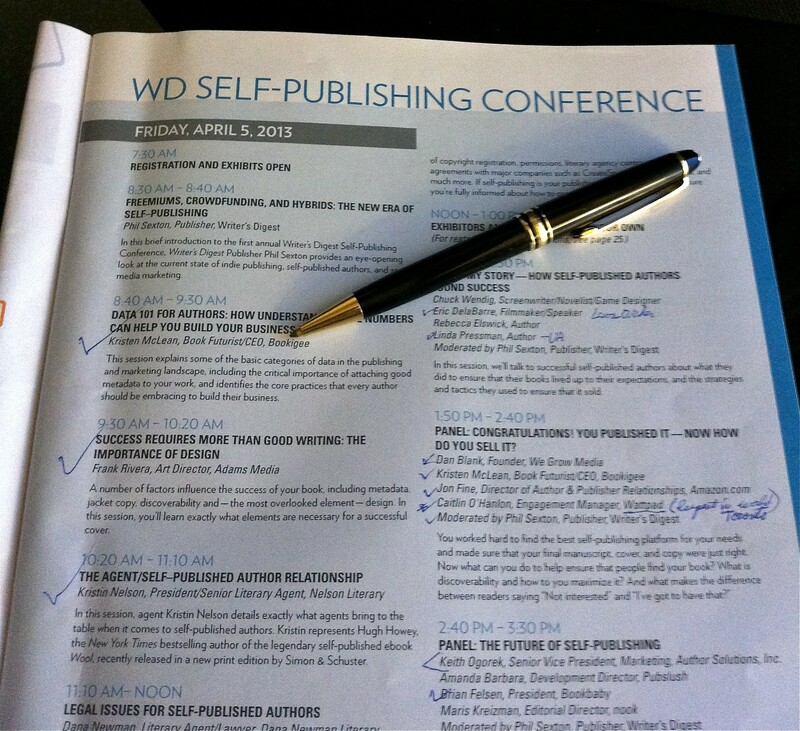 I just returned from the annual Writer’s Digest Conference (WD), in NYC, which included an entire day devoted to self-publishing, during the three-day event. It’s surprising how the publishing world has changed in one year. From the growth of “metadata” techniques to the successes of a new category of “hybrid writers” (those who combine self-publishing with traditional publishing) to an evolving role for “nimble” agents, a vanguard few who are transforming from traditional agent to “change agent”…so much valuable information for writers. It was interesting, as well, to see that in the midst of all this dazzling change, some basic things remain the same. I’ll elaborate below. Here are a few highlights gleaned from the presentations. I think they are accurate or representative of the publishing marketplace, at the moment. A new category of “hybrid authors” is emerging, those who combine self-publishing and traditional publishing for the same book project. “Hybrid authors” sell more books, on average, and receive 38% more book revenue than either traditional or self-published authors, and they are more aggressive in marketing. Marketing is up to the author, regardless of traditional or self-publishing. While not new, many writers still think publishers do the marketing. That’s not the case. The one key advantage of traditional publishers is they assign an experienced project editor to the author, guiding the book from beginning to completion (content, line, and proofreading editing). Self-published authors must do the same, on their own. However, a traditional publisher controls the content, design, and keeps the book rights, paying the author only 15% of sales. Advances have almost disappeared, except for major authors. The democratization of marketing online is what is new and essential, not the author’s platform. “Authors have a load of work to do,” said Joe Fine, of Amazon.com. Word-of-mouth is still the best way to reach readers, based on a recent survey. Distribution is king. When selecting your publishing imprint, think how it can be distributed as far as possible. Some self-publishing houses are proprietary, limiting distribution. Know your audience, first. Define the audience in detail. Then plan marketing accordingly, including who is on your launch team. The “author’s page,” as an online site, is the critical place to sell your book. While self-publishing is no longer a stigma, some traditional writers and agents still hold onto remnants of the past. Why? Unfortunately, many self-published books are not written well or carefully edited. “If you write a good book and it develops a following, believe me, the agents will find you.” – Keith Ogorek, of Author Solutions, Inc. Understand the “metadata” and check it frequently as your book travels through the distribution pipeline. This is more important as we move toward an open source Web, worldwide (Web 3.0). If data can’t speak to each other, a book’s availability becomes limited in a worldwide marketplace. Good data results in more sales. This is a growing topic. Book design is more important than ever, for e-books and print. In short, consider paying for a professional book designer who knows the current marketplace, including the technology necessary for your audience to find your book. The cover art and layout is critical. Don’t rely on your best friend’s artwork…if you want readership. While authors are more empowered by self-publishing, readers are also more empowered…by online distribution. They have far more choices for books to read. Marketing is still marketing. The basics are not new. Only the delivery systems have changed. Social media is only a means, among many. It’s good to keep up with social media and online techniques, but it’s far better to spend most of your time writing a good book and knowing your audience. Good writing! Nothing is more important than a well-written book. It trumps clever marketing ideas and establishes your reputation among readers. Editing. Nothing turns off a discerning reader faster than poor editing. These are only a few highlights from a huge array of detailed information. If you want to know more, let me know. I’ll probably post again on this subject in the days ahead. If you are genuinely interested in self-publishing, you can attend the “Publish Now” seminar for writers, all day on Saturday, October 26, 2013 at The Writer’s Center, in Bethesda, Maryland. This is an annual “how-to-do-it” event that will speed your way to publishing your work. You’ll learn what to do and avoid many of the common errors, all from a dependable, independent source. Check their website for details: http://www.writer.org or call: (301) 654-8664. In the meantime, we can all enjoy writing, writing, and rewriting…as well as reading a great book. It’s a good ride.